Some time in the late 1800’s and old Mexican woman was tending to her garden when the little shovel she used for turning the dirt struck something solid, but the sound it made unlike a shovel striking a rock, caused her to unearth the object. To her amazement was a strange little chest made out of iron. 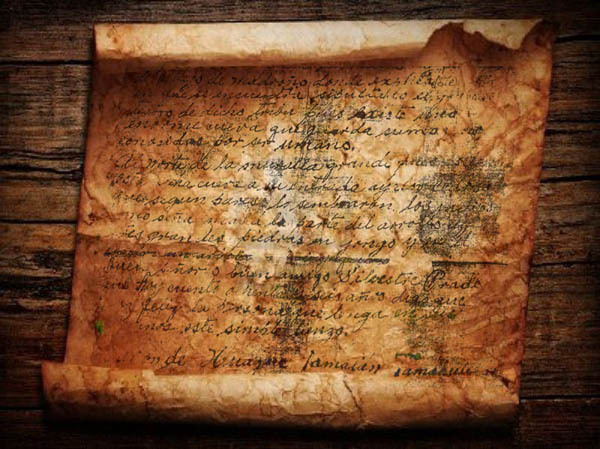 The woman opened the chest to discover and old piece of parchment paper in which she carefully unrolled from the scroll it formed. Upon glancing at the document she could see it was written in her native tongue, but being illiterate, she took the document and placed it with her old papers she used from making patterns for dresses. Some years latter a school mistress was visiting her old friend and asked her if she had any old papers she could use to cut some patterns, the old woman fetched the old papers and the school mistress began to cut up the old document when she focused upon the written text and realized the potential value of the papers and so she took them in an effort to preserve them, she transcribed the message the old documents had to relay with only one or two words that were illegible. It would be some years later when a noted historian and one time Historical Advisor to the National Park Service in Tucson acquired the transcription. Fascinated by its contents he took a break from his normal life and made his attempt at some treasure hunting. Unfortunately due to the lack of technology and travel restrictions of the day, it was very difficult to travel the region at the time, he was not completely unsuccessful as he gathered much information pertaining to its key topic and target but not ever knowing what he had found. I express my gratitude to fellow researchers for the meticulous nature it takes to discover the unknowns… in this case, Thank You Mr. Randy Bradford. The following is the basic contents of the old parchment documents…. "This began in 1811 and ended in 1815. In the name of God and of Mary of Guadalupe, I speak the clear truth in view of the fact that what these documents relate is clearly truthful, that they being enclosed in a casket of iron and wood on the 13th day of May 1818. I charge those persons who remove them to comply with that which they command and here you should find instructions of the buried treasure of (City) to the (Geographic Feature). Coming from (City) by the road of (Name), as soon as you should be on the small ridge, you should see before you a peaked bluff and a wild tangle of woods, circular in form and palisaded with entrance from the plain and located at the foot of the mountain. Enter to the (Direction) of this and you should find a rock, the height of a man, with ·5 bar marks and 3 other marks across these. In the direction in which you should see that these cross marks point, you should measure with a straight cord 30 varas and you should see another rock partly buried and showing one half vara above ground. Uncover and You should find 35 loads of minted silver. You should continue past the bluff by the small ridge that points toward the ranch of (Name) and on the right you should find a small ravine. You should seek for a flat rock, there being no other, and before you, you should see a thick oak with a great hooked spike and you should see on the rock 5 bar marks and under it You should find 7 loads of minted silver . You should follow the road toward the crest of (Name). You should pass the Arroyo of the River of (Name). You should ascend straight toward the flank of the (blank) trees. As soon as you should ascend a little table land from this same little plain you should look toward the center of the gorge and You should see three small knolls forming a little depression and in this You should seek the center where You should scrape with a hoe and find 5 stones driven into the ground and there You should uncover and You should find 40 loads of minted silver and 2 loads of minted gold. You should bear for the first land mark three partially buried rocks. One You should find on each knoll . You should continue by the same road of the crest that over looks (Name) as soon as you should ascend to the first bench and you should look forward the ranch of (name), You should see an arroyo before reaching this you should seek for a ball shaped rock one and a half varas high with 5 bar marks, toward where a cross mark points you should measure 6 varas toward the side of the ranch of (name). Uncover and You should find 5 loads of minted silver . Follow the road up the crest; You should arrive at the second bench. Place yourself at the foot of the following grade; look toward (name) and you should see an arroyo. In this you should find a thick tepehuaje tree ringed with a cinch with the buckle tongue driven into the tree and a twin tree bearing three nails. Where you should see these signs before thee you should see a small level space in front of the arroyo. In this you should seek for 5 rocks partly buried and in a circle uncover and you should find 26 Ioads of minted silver . You should continue by the same road and you should arrive at the third bench. Standing in the center you should look toward the right in the direction of (Name) a flat rock with 3 bar marks and before thee another with a half moon . Here you should uncover and you should find 8 loads of minted silver and to the left you should see a small [word illegible] there being no other and you should remove the rocks from over this and you should uncover 16 loads of minted silver . You should follow the same road and on ascending the bench of the crest that without obstruction overlooks (name) and you should see to the right an upright rock partly buried. It protrudes above ground a third of a vara. You should measure 26 varas straight toward to the same side; You should find a line of [word illegible] partly buried. You should uncover 7 loads of minted silver. You should continue the road and upon reaching the highest point of the ridge you should ascent it; and you should look toward the ranch of (name) and you should find very close a small peak that is called (Name), and only has one entrance. Ascend to the top and you should see the side that the sun sets on a small ravine that has its beginning at the top of the peak. Follow it and below you should see a rock with 5 very small bar marks and from this measure 12 varas in the same direction. You should uncover 11 loads of minted silver and 1 load of minted gold and one third of jewelry and you should also find testament of this treasure on paper written by my brother, Antonio. You should follow the road of (name) and upon descending the ridge of (Name) You should arrive at a small pass where a road crosses to various points I note you one called to the (blank) and where the road becomes easy you should stand and before you, you should see a high mountain that is called (name) and from this is born a sharp ridge from the top toward the side of (name) and on it is formed a gorge called (name) or of the (name). You should enter this until arriving at 2 large notable rocks. On each of these you should find 8 bar marks and toward where they point you should measure 20 varas and you should find 3 rocks partly buried and separated and there you should uncover and you should find 20 loads of minted silver. On the other rock you should find over the 8 bar marks 3 others crossing these and toward where these point you should measure 28 varas. A partly buried rock, on edge, has two holes and a line, forming a skull and before these you should see another partly buried rock that has on its top three twin rocks. Uncover between these and you should find 28 loads of silver covered with the pack saddles of the mules that fell dead from this same rock. You should look toward where they point and you should measure 6 varas and you should find a partly buried rock that is 1 ¼ varas long. Uncover it and you should find 2 loads of minted gold . You should continue the road toward (name) and You should descend to the plain of the (name). You should see a small arroyo that crosses the road and at its juncture with another that comes from the (blank) and from the last (name) tree, you should measure 5 varas toward the side of the )blank) and You should see 4 small rocks partly buried. You should uncover 5 loads of minted silver . From here you should pass to the mountain of (name) where you should find again as much treasure deposited by my brother Antonio. Before reaching the (name) you should see to the left an (name) tree and from this you should measure toward the side of (blank) 15 varas as one points to the callots that is driven into the ground. Uncover and You should find 7 loads of minted silver . You should ascent the mountain of (name) on the side of the (blank) you should see a large rock with 5 bar marks . Where they point you should see another rock but smaller with 3 bar marks and toward where they point you should measure 8 varas and you should find 8 loads of minted silver . On the first flanks of the mountain of where are four (name) trees at the center you should dig and you should take out 4 loads of silver bars and you should ascent the mountain where there are two (Name) pine trees on that side on which the sun rises and between you should dig and you should take out four loads of reales and you should go to the (blank) dig and you should take out 6 loads of money and a tinaja] of gold jewelry and you should go to the sharp ridge of the (name) looking toward the back of (name)down you should go to where there is a spring and you should count 30 paces and you should take out a tinaja of doubloons and further You should go up some 50 paces and you should dig where there are four partly buried rocks and at the center you should take out 5 loads of money and a box of gold jewelry and further______________________________________________________________________________________________and you should take out the treasure that you desire. And then you should ascend the rear flanks of the same mountain and you should seek for three little arches of partly buried rocks in that of the center you should dig and you should take out a box of doubloons ." In order to take this project to the next level of research a trip needs to be made to a California University, to research the private papers of the 1912 Historian. Short of going myself, I am fresh out of ideas as to how to overcome this seemingly small brick wall….